Learning to ride has never been cooler than with the 14" Dynacraft Hot Wheels bike with turbos poke. Featuring turbos poke, a bicycle exhaust system, which makes this bike look and sound like a real motorbike. A sturdy steel BMX frame with a high gloss finish and exciting flame graphics, this custom Hot Wheels bike earns first place in style! 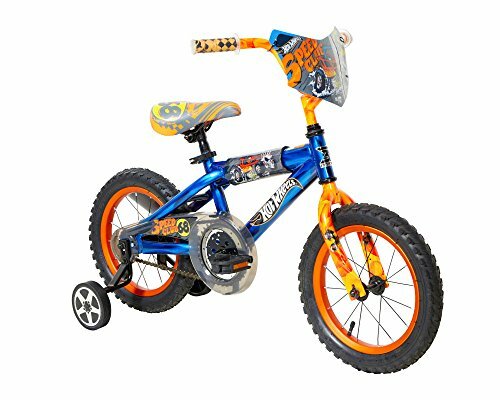 Sized perfectly for a young rider, the 14" Dynacraft Hot Wheels boys' bike with turbos poke features adjustable, removable training wheels for young racers who are just learning to ride. Equipped with a rear coaster brake, riders can safely stop.